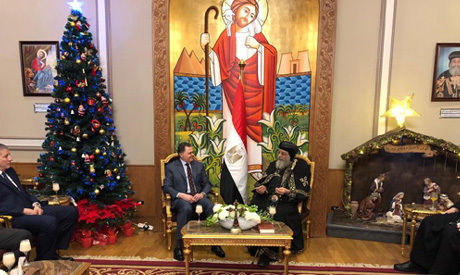 Egypt's Minister of Interior Mahmoud Tawfik paid a visit on Monday to the Coptic Cathedral in Cairo to offer Christmas tidings to Coptic Orthodox Pope Tawadros II. Minister Tawfik extended the tidings of the entire police force to the pope and all Christian citizens on the occasion of Coptic Christmas – which falls on 7 January. Tawfik praised the role played by the Egyptian Church in strengthening national unity, patriotic sentiments, and stability in Egypt. Tawfik affirmed that the Egyptian people, through their devotion to unity, diversity and patriotism, have defeated the plots which aim to undermine the historical fabric of Egyptian society. Meanwhile, Pope Tawadros II praised the role played by the nation’s police, stressing that the sacrifices of policemen serve as role models in defending the homeland. The pope expressed his confidence in the ability of the police to maintain the security of Egypt. The Pope offered condolences to the police force for the fallen police officer Mostafa Ebeid, who was killed late on Saturday while attempting to defuse an improvised explosive device found near a church in Nasr City, Cairo.